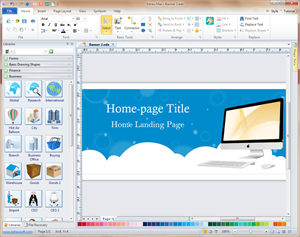 Creating banner with free templates and examples. Banner design has never been easier. Banners are graphics at the top of a website, showing company name and logo, or advertising products or services. Banners are usually catchy, informative and inviting, so as to attract visitors to come for more information. Banners are embraced as one of the most popular online advertising tools which are visible anywhere on the internet. Edraw provides the an easy way to create and share web banners and advertising banners, much easier than Photoshop does. The extensive ready-made shapes and templates in the software provide great convenience and simplify your design process. Edraw banner software is seamlessly integrated with advanced features that can be mastered by anyone without professional drawing skills. With the Pen tool, you can draw any symbol and graphic to make your banners unique and appealing. Above we have chosen a practical home page banner example for you. You can download and change background, text and images. A Christmas banner example is readily available in vector format. Anyone could click to download and save for your own use.